Blake Bell News: Bill Everett Archives v1 final cover! Book to printers today! Bill Everett Archives v1 final cover! Book to printers today! It's equal parts exhilaration and unease whenever a book you've taken from conception to reality leaves the publisher's hand for the printing press. It's that moment when that moment comes, after months and months of knowing you can make changes, that you can no longer have an impact on what will be the final product that is in print forever. I've gotten much better about being super-diligent on checking and rechecking those final .pdfs for errors, but you just never know. Mark Evanier once said that it was inevitable that he'd get back a book, and the first page he'd open would have the one type in the entire job. 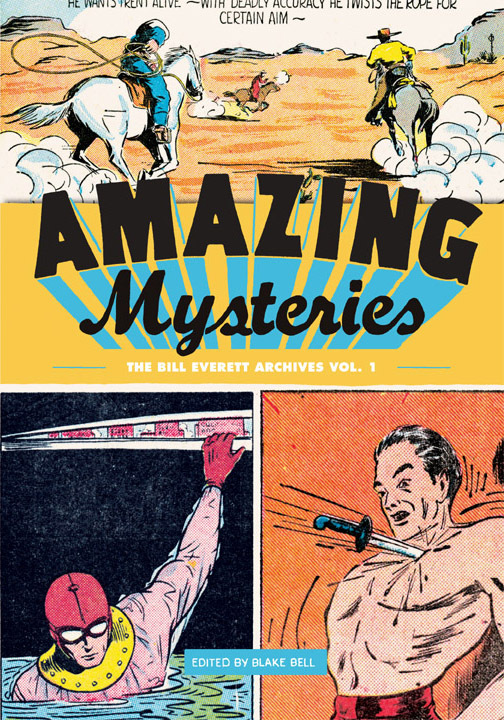 Amazing Mysteries: The Bill Everett Archives v1 collects, for the first time, some of the earliest original comic-book material, all from the pen of Bill Everett – one of the true originals in the annals of the Golden Age of Comic Books. Everett – one of the first “five-tool players”: writer, penciller, inker, letterer and colorist – created the Sub-Mariner in 1939, the first mutant in the Marvel Comics Universe and the first anti-hero in comics. It was Everett’s sensibilities that paved the way for the X-Men’s Wolverine and other morally-challenged characters whose anger and disfranchisement saw them walk a fine line between hero and outlaw. Everett is also “famously unknown” for co-creating the blind superhero, Daredevil, in 1963 with Stan Lee during the Silver Age of Marvel Comics. Bill Everett, however, wasn’t always a “Marvel Man”. This volume brings together rare and classic material from as early as 1938, over a year before Marvel Comics #1 hit newsstands in late 1939. 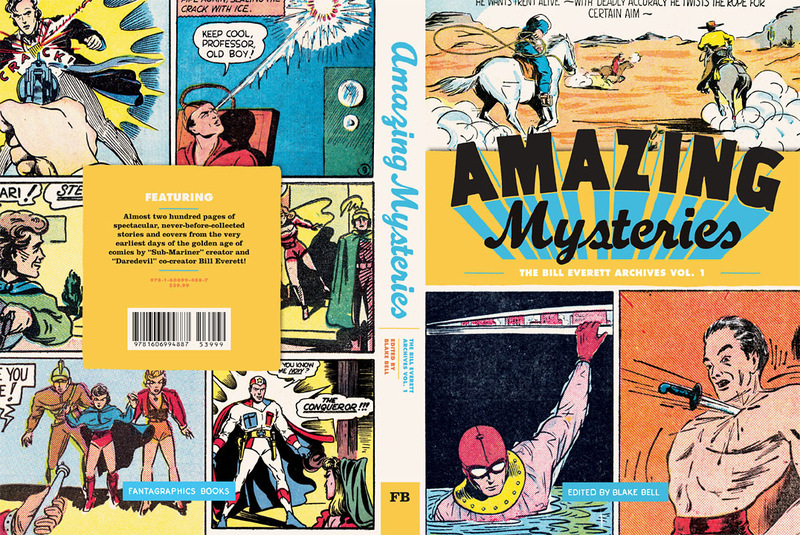 The pages that follow feature Everett's work for Golden Age titles like Amazing Mystery Funnies (1938), Amazing-Man Comics (1939), Target Comics (1940), Heroic Comics (1940), and Blue Bolt Comics (1940) to name a few. 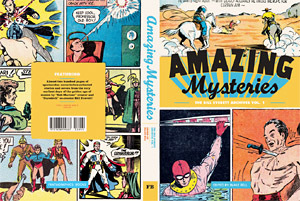 These books display an endless array of Everett-drawn characters such as Amazing-Man, Hydroman, Skyrocket Steele, Dirk the Demon and more. 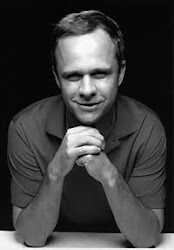 The majority of the comics were produced during Everett's early years as lead artist and Art Director for a company named “Funnies Inc.”, a collective of writers and artists that sold packaged comic books to first-generation comic-book companies like Centaur Publications, Novelty Press, Eastern Color and Timely Publications (known today as Marvel Comics). Click HERE to pre-order the book from Amazon.com and stay tuned to this blog for more updates and previews as we inch closer to the book's release date! Congratulations on finishing what I'm sure will be a marvelous addition to your books in print, Blake! Hi Ray. Thanks for the kind words. Bob, you know better than to assume that just because geniuses like us know about Everett's contributions such genius won't always translate to the "common". ;) I bet if you polled the "99%" (of comic fans, I mean), many would say Frank Miller created Daredevil! :) At least a lot wouldn't even remember that Everett was connected to the art in issue #1. They'd probably say the artist was Wally Wood (maybe even Joe Orlando). The size of these books, 7.25" x 9.5", is it your choice or the publisher's imposition? Would you make them bigger if you had your way? If you could, would you make them the same size as "Fire & Water" and "Strange and Stranger", 9" x 12"? Personally, I'm baffled that the biographical tomes are the ones that are huge whereas the books collecting the actual comics are tiny, and while I'm sure you can enumerate all kinds of commercial, technical, or whatever reasons, I doubt they'll assuage my frustration.